I have a 2000 Winnebago Ultimate Freedom 40JD (Spartan Chassis) - does anybody know where the air chuck is located? I would like to locate this in case I ever need to get towed. I've looked around, but can't seem to find it. It's probably better to locate it now rather than in adverse conditions! Thanks in advance for any pointers! My Freightliner chassis has two , air system fill points , one on the air system dryer ( looks like a standard tire fill valve. ) Second is drivers side of the gen set and is a quick disconnect style. EDIT: Sorry , didn't realize till I posted that I didn't have the connector circled . Bottom right hand corner with the yellow shut off lever. If you don't find it, and a Spartan chassis owner doesn't answer your post , maybe a call to ; Spartan Motor Home support with your serial number will get you the info you need. I see the fitting in your picture. It is a female fitting and wonder if you have ever tried to air up with it. Our tow truck had a female end on the hose. A male end is open and would just leak air. We would pull the wet tank drain and screw in a male fitting or use a clip on air chuck on the air dryer schrader valve, if equiped. Never been towed or broken down. KNW. I guess , I'd better carry 2 male ends and a connector , or my own hose with 2 male ends. Or be prepared to wait for a flat bed . I had seen this before - but never thought it would be considered the air chuck. I guess this is all I have (from what I've been able to find). Do I need to consider making any modifications? Knowing where it is would be a big help to anyone trying to tow ( or move your coach on to a flat bed ) if the engine can't be started. 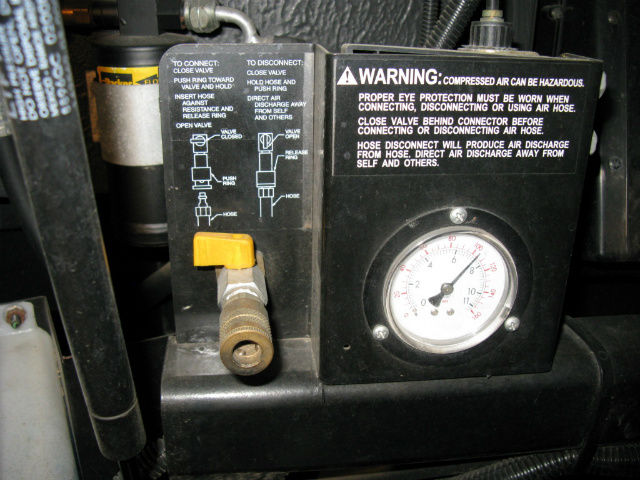 If you have an air compressor in your garage , or a portable , you could try airing up the coach , from that fitting, just to test it's operation. Towing company operator should be able to hook on to that fitting and supply air pressure full time , if necessary , from their trucks compressor if they think your air system is leaking down fast enough to be an issue while their moving the coach around. In our coach, an '04 Itasca Horizon 36GD with the 330HP CAT, we have three "air points". The first is on the air dryer and is a normal schrader valve. The second is on a small manifold with another schrader valve, almost in the same place as poster #2 has his. the third is just above the generator, on the passenger side, and comes with a valve and an air gauge. As for filling the coach at any of those points. Well, I've experimented more than once. The air systems on these coaches, have various check valves and other valves. Here's what I've found out so far. If I park the coach and let it sit for a while, maybe a couple of days. Now, I've not leveled it, meaning I've not dumped the bags. So, I park it with full tanks. But, after a couple of days, my air system will have bled down to about 80 psi. or so. At that pressure, I can insert my double male ended fitting into the air chuck with the gauge, and then plug my home air compressor hose into that and, it will fill the entire air system back up to the max capacity of 130 psi. which will blow the bleeder on the air dryer. Or, I can fill the system with the other schrader valve, located on the driver side front too. Of, if I choose, I can also fill it via the schrader valve on the air dryer. But, and here's the kicker, if I let that air system bleed down to lower than 60 psi, and plug into the double male ended adapter that's in the air chuck with the gauge, a check valve some place in that system has closed and there is no possible way to fill the system, from the front two air points. At that time, the only way for me, or a tow truck driver, to fill that system, to keep the brakes off, is the schrader valve on the air dryer, PERIOD! NOW, are all air systems the same, not a clue. Do other guys with air brake systems have that same check valve that closes after the system has bled down to around 60 or less, not a clue. All I know is, mine does and, it will not allow me to fill the air system, via an outside source, without going to the air schrader on the air dryer. That female fitting, I believe, is for using air FROM your system. Inflating toys, tires and blowing out debris. It has a protection valve to prevent complete loss of air, if the supply line, leading to it, fails. It also prevents complete loss of air if you were to leave a hose in it and it got rip off, leaving you enough air for your brakes, to get to a safe place. I believe most female connector fittings will be like that. So , I'll figure what Fire-up and twinboat are saying is the valve at the front of the coach is located somewhere in the air system down stream of the brake system air protection valve , that would lock that fitting out of the system to keep 65 psi for brake operation . Well , first back to my air system diagram , , and I've learned something today , time to start Happy Hour and put the lap top down. You are correct in that, that female air chuck is used for tire inflation, toys etc. But, as stated, it can be used, if needed, to fill the entire air system, IF, the system is still ABOVE 60 psi. If below, you're out of luck and, the tow truck driver will have shimmy under the rear part of the coach and fill the system with the schrader valve on the air dryer. (Hope the Tow truck driver didn't eat too much for breakfast, that coach is pretty darn low if the bags have depleted their air. P.S. And don't expect ALL tow truck driver to be competent on air brake systems. A friends Vectra broke down in the northern Sierra mountains in CA and had to call a tow truck. The driver didn't have a clue that there was a schrader on the air dryer and tried for quite some time, to fill the system using the front two air points. He failed because as stated, if the system is below 60, you can't fill the system from those two points, at least on that one and mine. You HAVE TO FILL IT from the schrader in the air dryer at that low of PSI in the system. Great information guys - thanks! Sounds like I need to do a bit of experimentation with my air compressor.